Elaine Annie Clifford was born in London on 1 September 1886 to Henry James Clifford and Annie Francis Hilton-Green. At the outbreak of war, she was living in the family's home, The Grange, at the south end of the Frampton's village green. When the Voluntary Aid Detachment hospital opened at Standish, Elaine volunteered to help; her service began in June 1915, just after it had opened. Between then and February 1919, she accomplished 2,075 hours. Her work included basic nursing, cooking and helping the soldiers to write letters home. 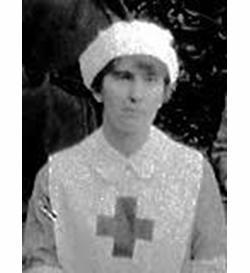 She was awarded the British Red Cross war medal in recognition of her services.